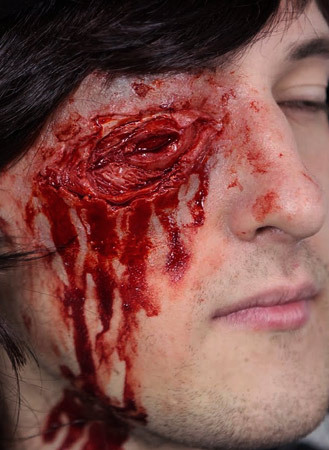 An extreme injury appliance, this Shot Out Eye prosthetic covers the eye and cheekbone area to simulate a horrific gunshot wound. If you want to dress as Carl Grimes at your next convention or party, this is the prosthetic for you! Watch the video below for complete instructions on how to apply a prosthetic – you can also find an easy to follow guide in this blog post, and you can read our 5 Top Tips for Prosthetic Wound FX for techniques to make this extra gruesome.